As I walked this part of the Watershed I passed a significant anniversary. 29th June 30 years ago saw Dave Hewitt complete the first ever Watershed walk at Cape Wrath. Am amazing acheivement done in a continuous walk and with a bit of a sting in the tail at the very end. Please note that the route around Dungoil is not the route (due to the obstacle of windblown trees) that I took but is the route of the Watershed. Cumbernauld! 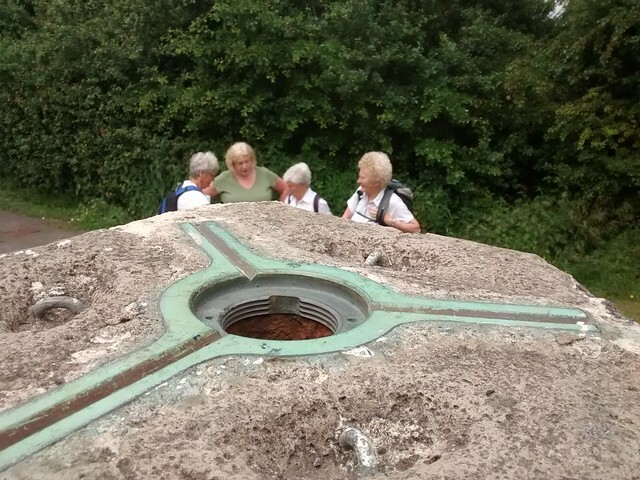 The plan was to share this part of the walk with a small group of friends who I had frequently walked with back in the 1990s and early Noughties. So Pat, Cathy, Heather and Anne were my companions for the first part of the day, with Cathy continuing with me as far as the A803. We gathered at Pat’s, where Stewart had served up croissants and coffee for those who had stayed overnight. 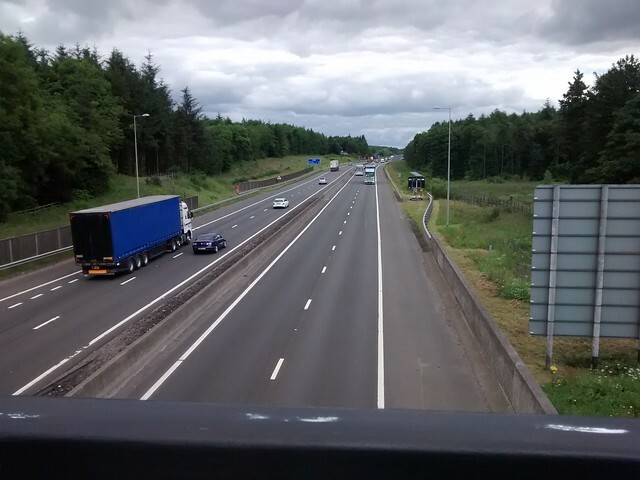 At the very civilised time of 10.30 ish Stewart dropped us at Cumbernauld Station , Another car was left at Dobbies Garden Centre, where we would have lunch. Stewart was also going to act as “mountain” rescue if Pat’s hip prevented her continuing or if I was flooded out in the heavy rain forecast for the next day. It has been sometime since we were all together so there was no shortage of news of families to share, of our various activities and our various ailments. In no time we were passing Tescos where the facilities were welcome after all that coffee. (For customers only, well, I had bought something at Tescos last week). The foot bridge over the main town centre road was next, right on track. Hopefully encouraging the others that I knew where I was going…for now. Onwards and the way wasn’t quite so clear descending to the bridge over the motorway and we digressed (deliberately) into Ravenswood, unfortunately marred by rubbish left by other visitors. 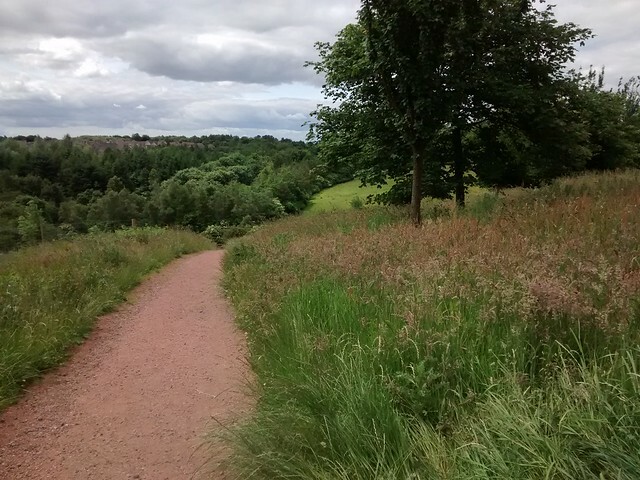 Over the motorway there was less chance to keep with the green pathways to begin with but then we came upon Cumbernauld community park, a delightful mixture of meadow and woodland. The ringlet butterflies abounded and I also saw what I think was a chimney sweeper moth but it could have been a small blue butterfly. I am ever hopeful of ticking this species off my butterfly list so will clutch at any straw. 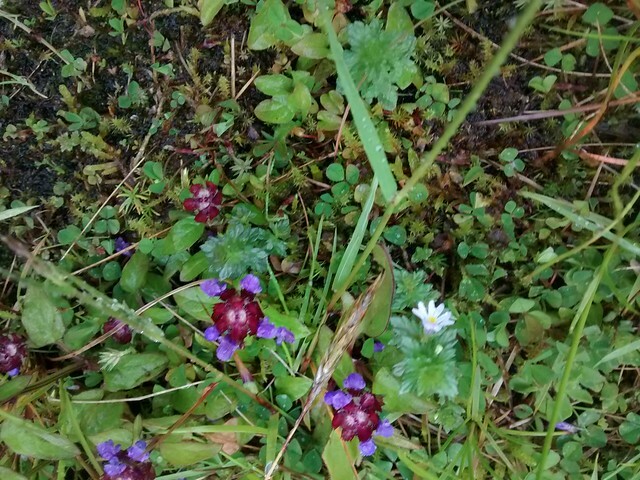 There are no records for the small blue in this area and I saw no kidney vetch (the food plant for its caterpillars) so it was probably a chimney sweeper. 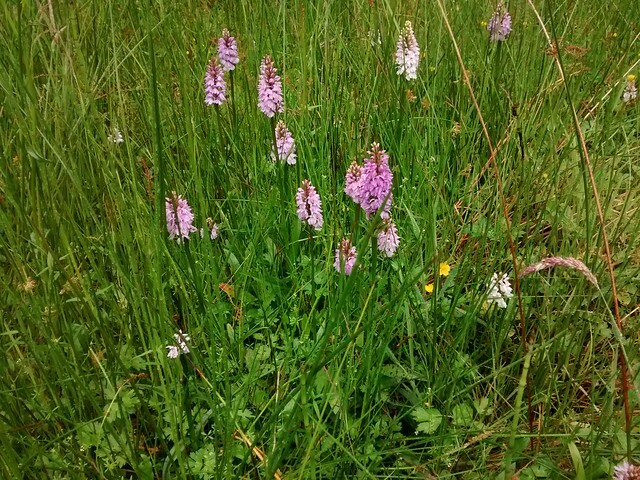 On my return home I looked up species records for the area and came across the statistic that 50% of Cumbernauld is green space and there is a project called the Cumbernauld Living Landscape project. 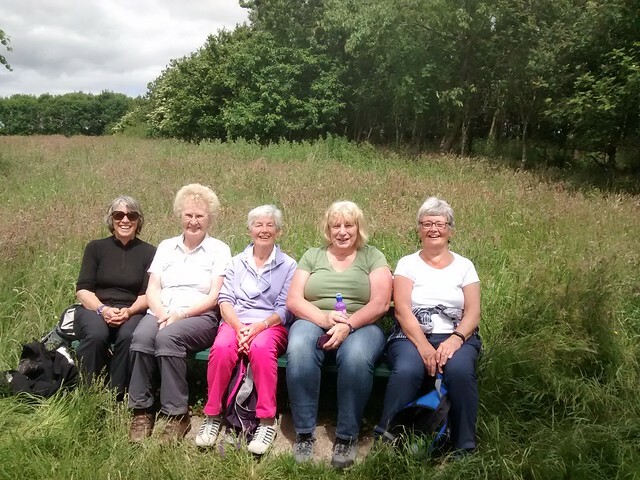 One of the aims is to try and link up the green spaces to make them more useful for wildlife. One unwelcome species made its presence felt by biting Pat. The rest of us were spared the clegg’s ferocious nip but I was disappointed (but not as disappointed as Pat) to see these as it marks the start of a month or so of the wee blighters. 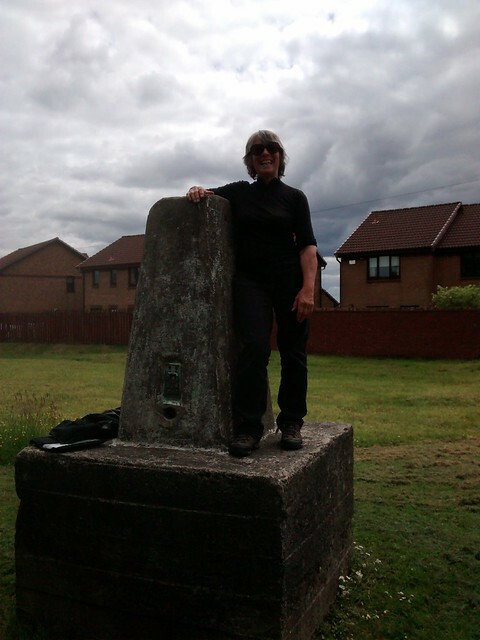 Plenty of photo ops at the Trig point and Roman Altar then into the Westerwood Estate to try and find the footpath through to the hotel. A path led off into the woods but there was no path subsequently, despite the map showing one. My companions had not had my practise at covering rough ground on the Watershed and who knows there may even have been a fence to climb at the other end, definitely not something that could be managed by all of us, so going off-piste through the woods was not an option. Heather was renowned for humming when things got tough out on the hills and I expected her to start any minute. 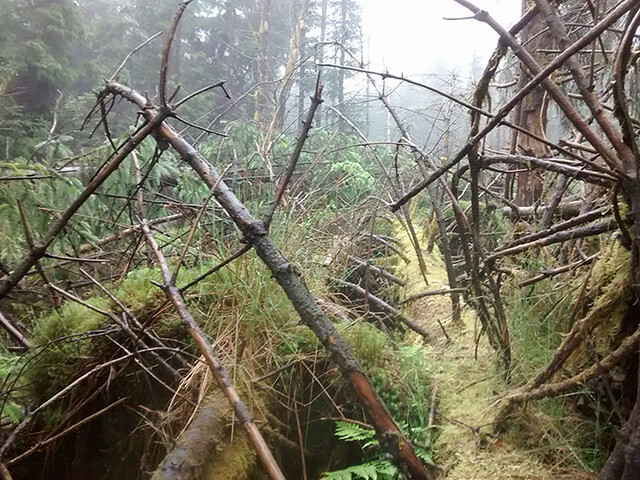 After exploring a number of dead ends and with hunger pangs getting ever stronger, a local resident advised that there was no path and hadn’t been for years. Lunch was now overdue so we returned to Eastfield road and then walked round to Dobbies Garden Centre for a well-earned food and comfort stop. 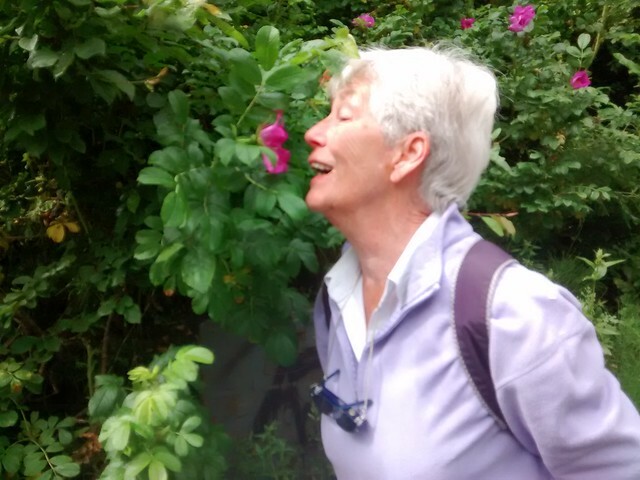 We had walked 5 miles quite happily despite our surroundings and Pat reported that she had no ill-effects with her hip. In our earlier days of walking a good tea shop at the end was an important requirement and as we ate lunch we wondered if the Post Office tea rooms in Glen Lyon and the village of Birnam still exist. A quick “google” would have confirmed that they do. It is a shame that they are not closer to the Watershed. 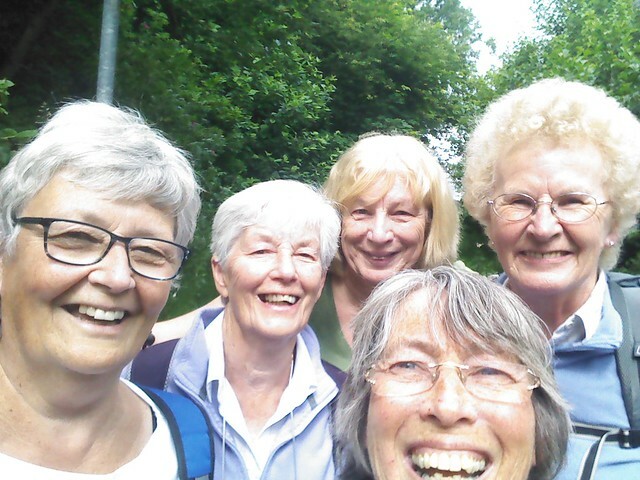 Cathy, who had travelled up London to join this walk, was up for continuing with me as far as the A803 where she would then call up Stewart, our trusty chauffeur, who would get her back in time for Pat and her to go to their bridge club. Pat and Cathy had been long time partners there until Cathy moved back down to her original stamping ground of the S.E of England. We had expected that the next 2-3 miles would not to take that long even though I was now weighed down with my full pack, extracted from the boot of Heather’s car. Cathy set off at a cracking pace and I had to shout out to remind her that I was now a bit slower. We eventually took the best part of 2 ½ hours to complete this bit of the walk and that wasn’t just down to my tardiness. 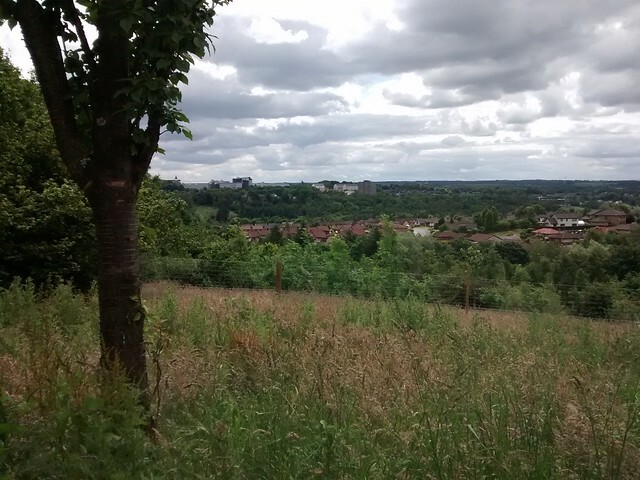 First we had to figure the way round a new housing development not marked on my map. We were helped by a woman popping up from behind a 6 ft fence to see why 2 women were floundering around in the bog behind her house. She directed us to the path we needed. We may well have been there to this day without her assistance. 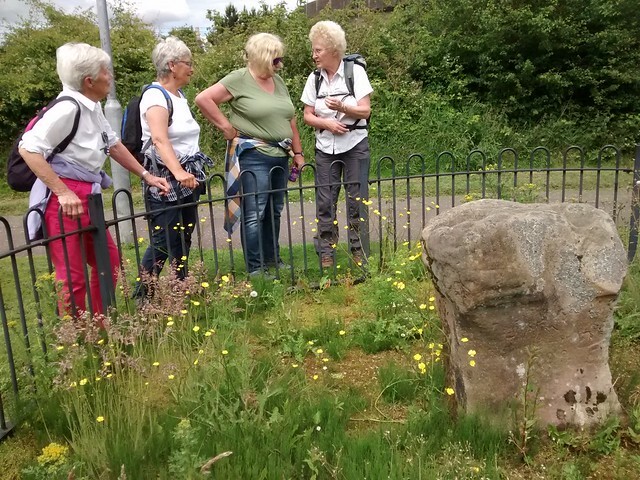 Cumbernauld airport was a useful indicator of where we were but once around that barrier we managed to cross the ditch and wall of Antonine’s Wall without realising. How the 2 of us succeeded in climbing numerous Munros together in sometimes appalling conditions is a mystery but then my navigation is always better when I can’t see a thing. Cathy’s error was leaving today’s route finding to me. Luck and the wish to avoid a field of cows led us to an underpass to get through the barrier of the railway and after that came Dullatur Nature reserve and a detour to the road and bridge to cross the next barrier, the canal. 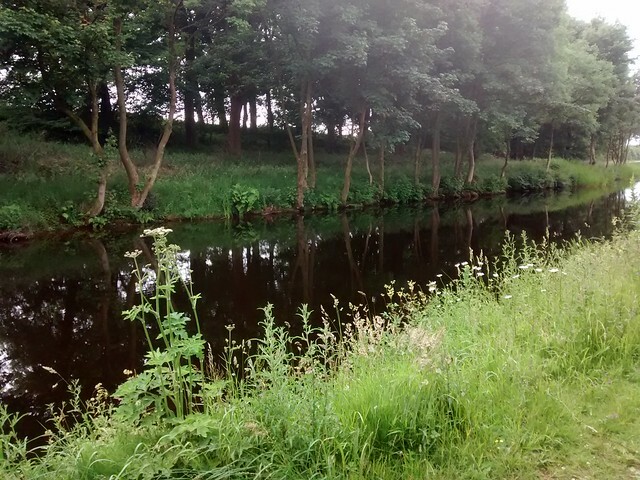 Just over ½ mile back along the canal and we figured out that we were back on the Watershed and made to head up to the A803 but after crossing a seriously boggy few metres we came upon a murky ditch full of red, rusty coloured water. Cathy was game for taking off her boots and wading through as it was too wide even for her to leap across. I prodded around with my walking poles and vetoed that plan. Who knew what lurked at the bottom of this man-made watery barrier that was at least knee deep. I would like to think it was concern for Cathy encountering a piece of broken glass or rusty can and spending the evening in A&E instead of going to bridge but I was also very reluctant to step into the unknown on my own account. 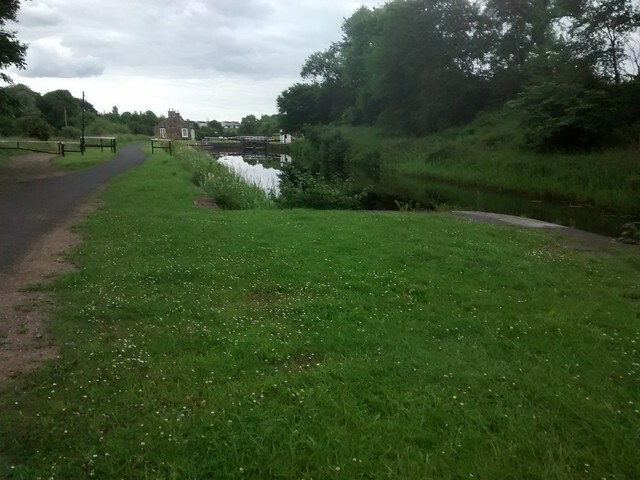 We hurried back along the canal and up to Coneypark to where Stewart could pick Cathy up. Pat and Stewart live just 10 minutes down the road from Coneypark and there was time for Stewart to drop me off at Auchincloch before getting Cathy back for bridge so I avoided a walk along the main road. Actually there was a footpath for the ½ mile I could have walked. In the mean-time I had phoned ahead to my friend who runs Meadowside Cattery with her daughter. I said I would be there in about 1 hour. Farewells were said to Cathy and thanks to Stewart who again reminded me that if I had difficulties in the deluge forecast for the next day I could give him a call. I think he had little faith in my ability to survive this. I had learnt that what looks to be a straightforward mile on the map could be anything on the ground of the Watershed. 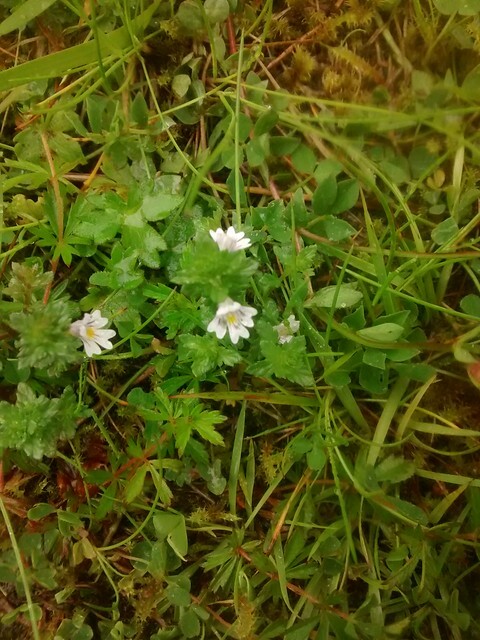 The next ¾ mile was perfectly straightforward, up a track and through some rough pasture and woodland to the base of a short rise before Meadowside. This little hill was buried shoulder high in bracken and it took as long to cover as the previous stretch from the road. I added bracken to the growing list of bêtes noires on the Watershed so I wasn’t wrong to have estimated an hour for the mile. I then spent a further hour with Helen and George, catching up on their family life, drinking tea and eating scrummy, home-made ginger scones in their kitchen. George explained that the Watershed actually travelled diagonally through the kitchen. George also repaired my water bottle which I discovered had been ripped by barbed wire at some point. I had to tear myself away reluctantly or I wouldn’t reach my destination for the night. Helen directed me onwards up the field to the woods before Doup. These were some of the easiest woods to pass through with plenty of rides in just the right places. 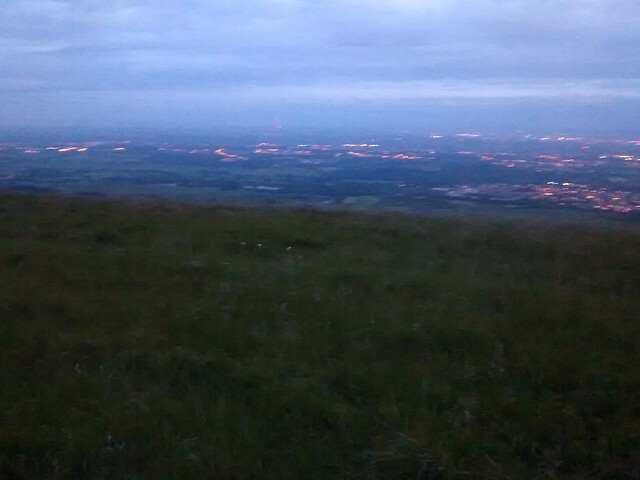 I was eager to camp up on the Kilsyth Hills, not least because a brief stop showed that in the shelter, out of the breeze the midges were out in force. It was late in the day but I felt full of energy after an excellent day by the time I crossed the minor road just above the viewpoint. 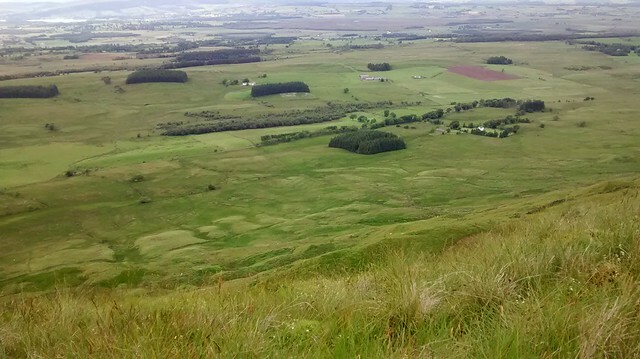 I was further energised by the views from the summit of Tomtain (453m) the highest ground since Craigengar at the end of the Pentlands. I spent a short time drinking in the vistas. 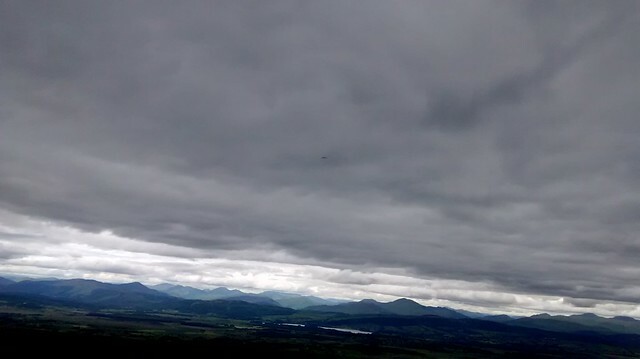 What a contrast between the views to the North and West (Ben Lomond!) and the heavily populated Central Belt to the south. 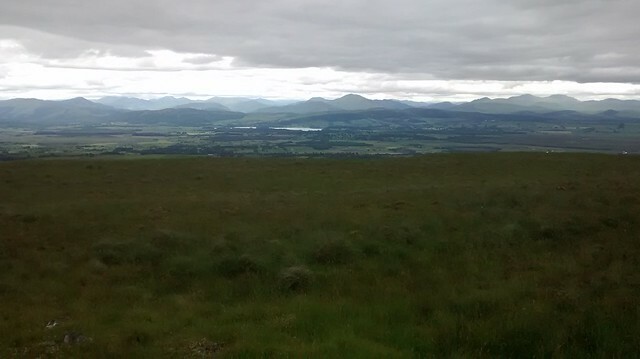 Tinto could still be seen further South and possibly even Culter Fell. 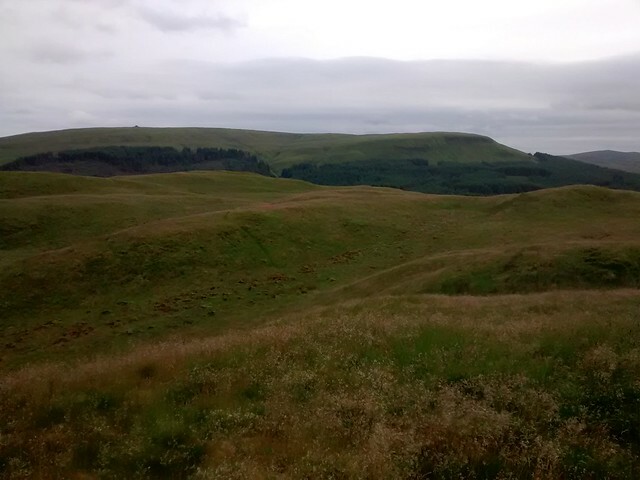 I was excited to look forward to a good walk along the Campsies the next day but tonight there was still light left to continue so I did, past the 2 Chapmen’s graves to Hunt Hill which was an excellent, midge-free campsite for the night. I reflected on what an excellent day it had been. Company of friends certainly made the crossing of Cumbernauld so much better and the sun had shone on us. So what if tomorrow is a downpour. I knew that the forecast for Tuesday was for heavy rain…all day so wasn’t surprised to be woken during the night by rain on the tent. I also know that it always sounds worse in a tent than the reality outside so I didn’t look out. A weather-check via my phone suggested 90% chance of rain before 09.00 reducing to 70%. The old adage of rain before 7, dry by eleven may hold. 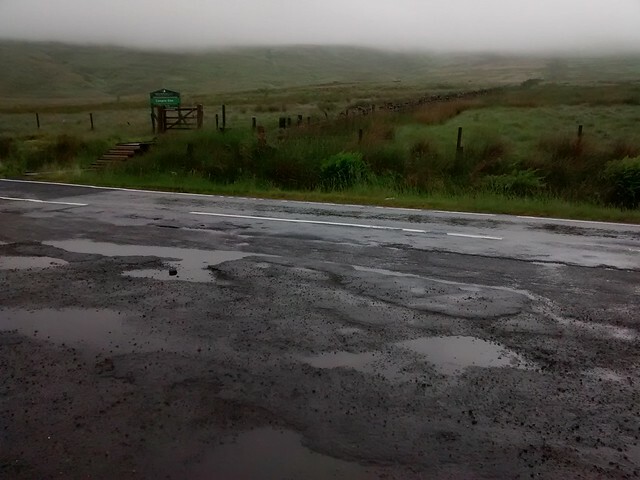 I didn’t hurry to move before 9 and right enough the rain started to ease but as I looked out I was disappointed to see nothing but a few metres of heather moorland and some ghostly trees. My anticipated views evaporated, unlike the mist. 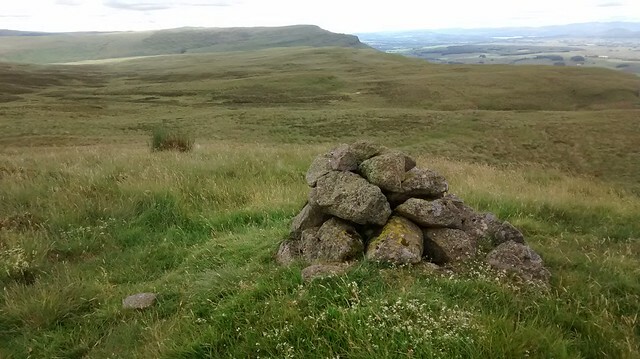 I soon found out that the Campsies are pretty featureless The first few miles to Black Hill I was able to use the fence-line as a convenient handle. 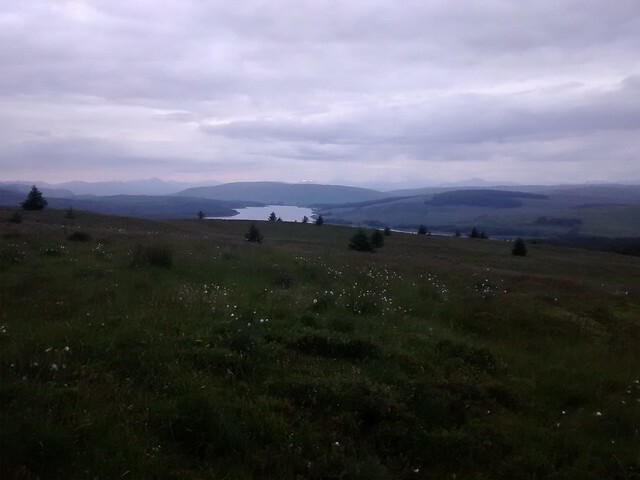 There were zero views of the Birkenshaw reservoir and all thoughts of climbing Meikle Bin as a short diversion were quickly dumped. 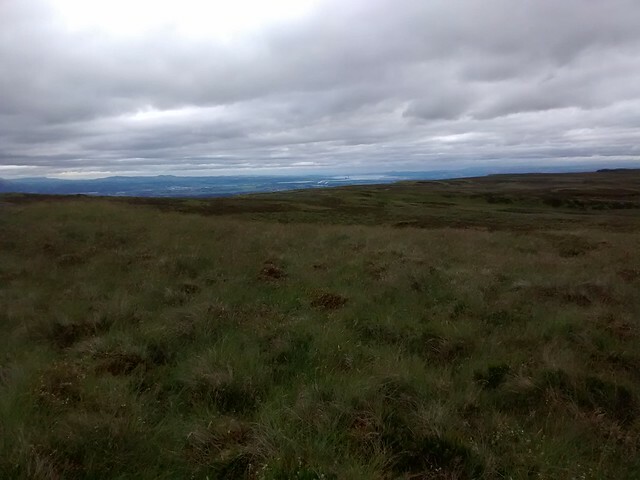 My progress slowed considerably as I left the fence to head for the unnamed 527m hill, on a compass bearing, with nothing but clumps of reed or bog cotton to use as targets and visibility down to a few metres. Occasionally sheep hove into view but refused to co-operate and stay still long enough to take a bearing off. 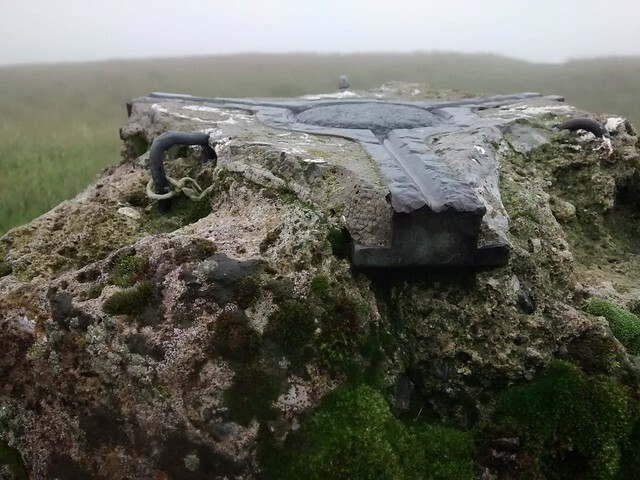 I decided to “nip” out to the Trig Point at Cort-ma Law (531m) and then used the path from there to Lecket Hill (547m) with its tiny, 'blink and you miss it' cairn. I emerged from the mist as I headed down to Moss Maigry and my first brush with forestry today. 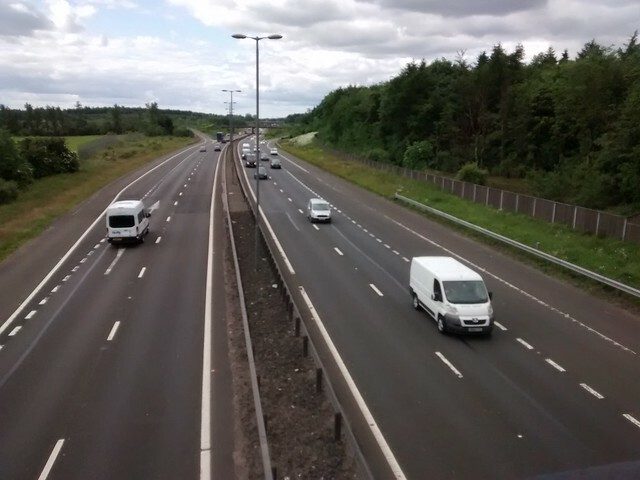 I could see a car parked at the high spot of the B822 (The Crow Road) and headed for it. It drove off before I reached it so no contact with human life today. I had a break in the layby. The Watershed crosses and recrosses The Crow Road 3 times and as the name has rather sinister overtones I hoped it wouldn’t be the portent of any disaster. 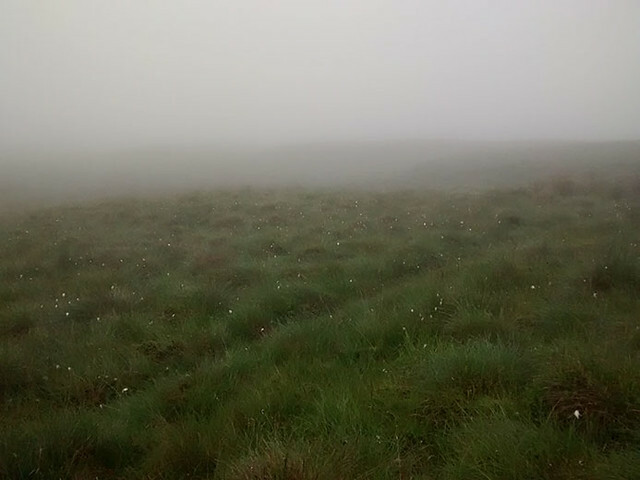 Back into the mist as I climbed to the summit of Holehead (552m). 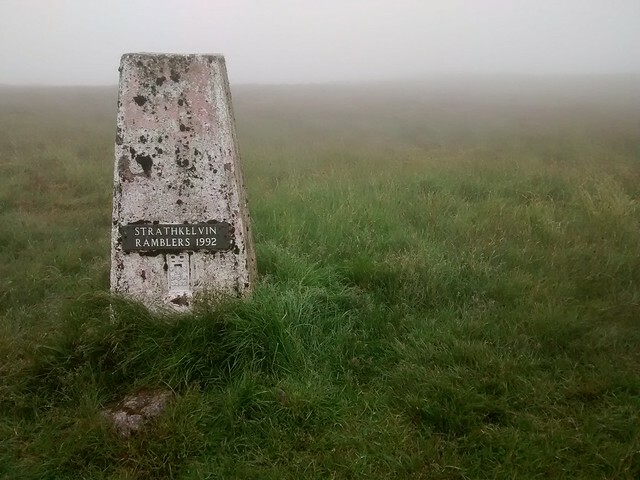 Such was the mist the Trig Point (551m) could not be seen from the Radar Station but a clear path led off to it. I revised my target for today in the light of slow progress. I would aim to stop at Dungoil. Again I fell into the trap of counting my Watershed miles before they are walked. 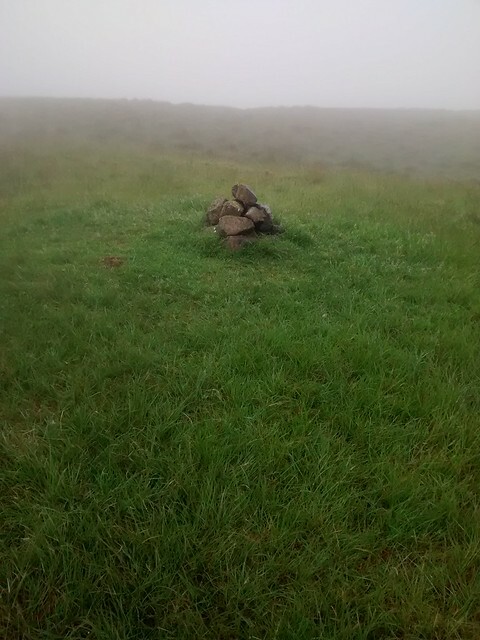 The mist did not let up as I headed over Dunbrach for the forest circling Dungoil. 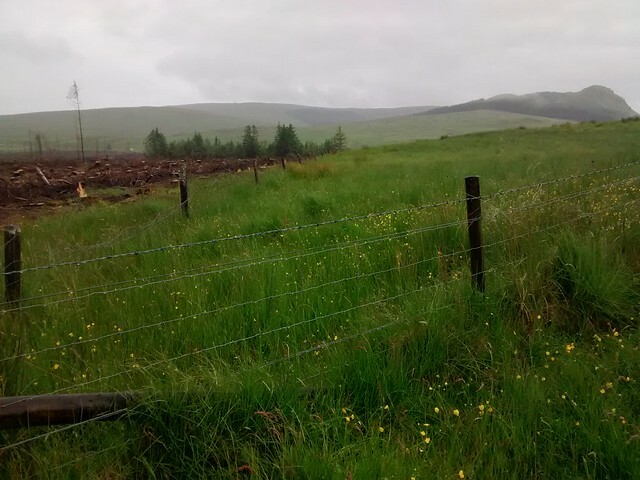 My experience of the Campsies forestry had been good despite both Peter and Dave writing of struggling through these barriers so what could go wrong? Wind blow that’s what. 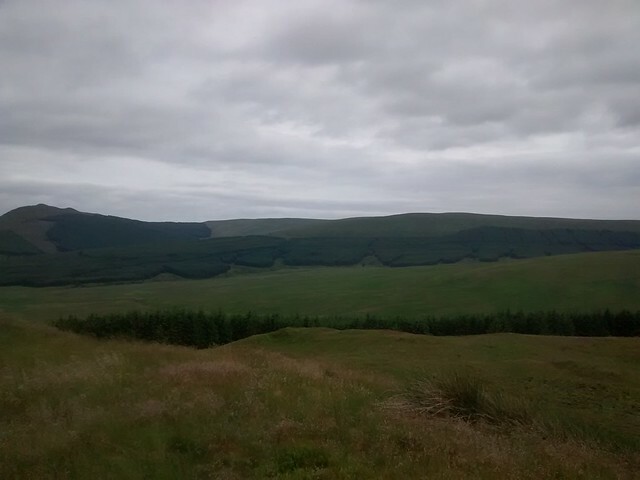 I could see some evidence of it as I approached but I was used to wind blow being on the edge of plantations, particularly where there had been some felling. This plantation had not had any felling done. My aim was a forestry track 200m into the forestry but within about 50 metres I came up against a number of fallen trees, tangled into a huge pick-up-stick pile. I moved to the left and forward a bit but that was no better. In fact, there appeared to be an endless barrier of trees so I would have to go over, or under or over and under. I have had a fair bit of wind blow scrambling in other situations (rhodie clearing on Knoydart)-without a full pack and without a pair of walking poles. The latter became a serious hindrance; up to now they had been my saviour when crossing bogs and tussocks, now they tangled with every single branch. Previously I had always been with people so there was no real danger. About three tree crossings in I became aware that I was in the midst of a forest with no mobile reception, about 2 metres above the forest floor (or 2 metres below the top layer of trees if I was crawling) I had no idea how far I was from the forest track or even if that was clear of wind blow. It was taking me a good 10 minutes to get across each tree and some of the trees I grabbed to haul myself up on, moved alarmingly. There would be nowhere to camp, having not brought a hammock. There was only one thing to do… start singing, so I broke into “I’m going on a bear hunt”. Thank goodness there was no-one around to hear me. Seriously, it was time to retreat, so I did but not without difficulty. A good (or rather bad) hour had passed by the time I was back at the forest edge. After fruitless journey to the west, I walked east to a spot between 2 streams. There was wind blow visible in the plantation at all points. My encounter had left me feeling down-hearted. I had been dry in my water proofs all day. In the forest water got down my neck as my hood was pushed off repeatedly, I was concerned that I had ripped my jacket or trousers (later I discovered that I had torn my water proof trousers). I had felt cheated that I had not had any views all day and although previously I had made small diversions off the watershed, this was going to mean a fairly major diversion. I also felt that given the poor visibility I had actually lost all sense of the Watershed. What I really needed was hot chocolate. As I pitched my tent on less than ideal ground, I could hear my granddaughter saying “Granny, seriously, you are not pitching your tent there! That is not level in any direction and you are right above a precipice.” I didn’t care, I was in need of hot chocolate and somewhere dry to study the map and my alternatives. Not the best night I have had on the Watershed but some choices had been considered. 1)	To explore downstream from my campsite. 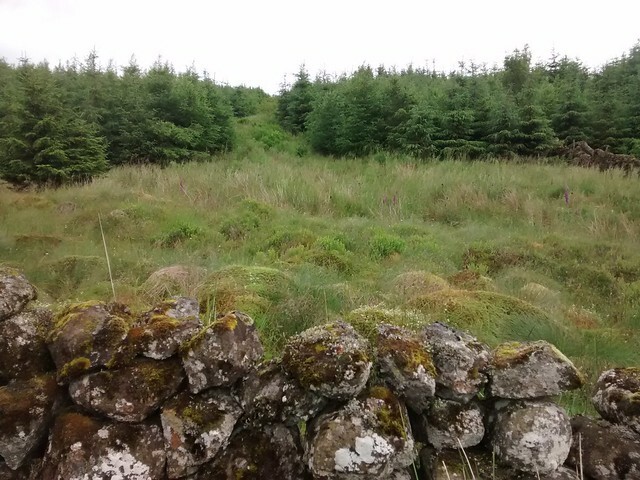 This was a clearing in the plantation and there was a track very close to the stream, just 100 m down. I could do this without my pack. 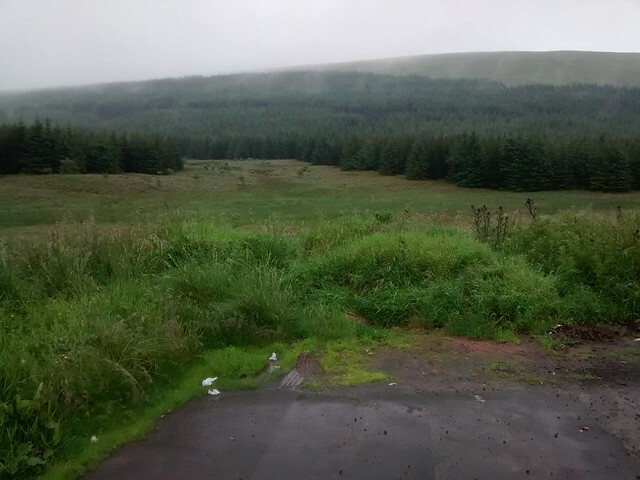 2)	To climb up to where there was mobile reception and call Stewart (just 15 miles away) to come and pick me up. I could fetch my van from their house and return, using the van as a base to explore the various forestry sections that the Watershed passed through in the next few miles. I could tackle 2 of the short sections through the forest by using forest tracks back to where I had left of. This option would also give me a chance to buy a new map case (not forest related but my 15 plus yr old map case had developed a tear and was letting in water) and a replacement bite for my platypus. This was one of the casualties of the crawl/climb through the windblow, having been pulled off and lost. I hadn't disciovered the tear in my trousers at that point. 3)	Call Stewart, pick up my van and go home. The last option was ruled out forthwith. Things would have to be desperate for that. Option 1 was my favourite as I went to sleep but somehow rejected when I woke up. I think I decided it would be pointless. As I walked to the B822 (just a couple of miles away) I decided to hitch rather than call Stewart, leaving that as the last resort. Almost immediately I was picked up by Courtesy Cabs of Fintry. 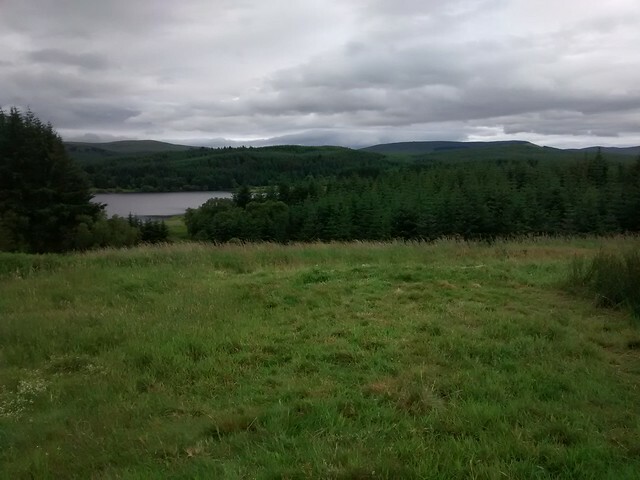 She was finished for her holidays and gave me a free lift as far as the Carron Dam, 11 miles from Denny so within walking distance (and all downhill). The 2nd vehicle picked me up within 5 minutes of being dropped off and I was soon walking up to Pat and Stewarts door, phoning them first to ask them to put the kettle on. After a shower (I did warn of clogged drains), lovely lunch and I was off with my van to Stirling for my bits and pieces then back to the Crow Road for the late afternoon. After tea I walked up the Watershed to the Forest edge then round to join the track as it enters the forest. No issues with wind blow on the track but plenty off it. 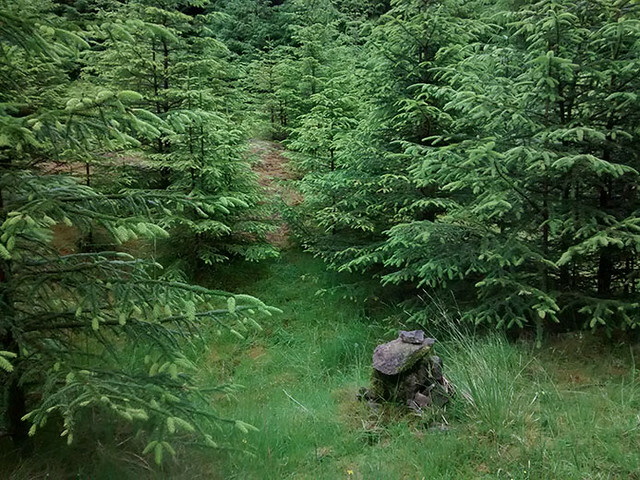 A cairn marks the spot where a faint path leads through a short section of forest onto the hillside. 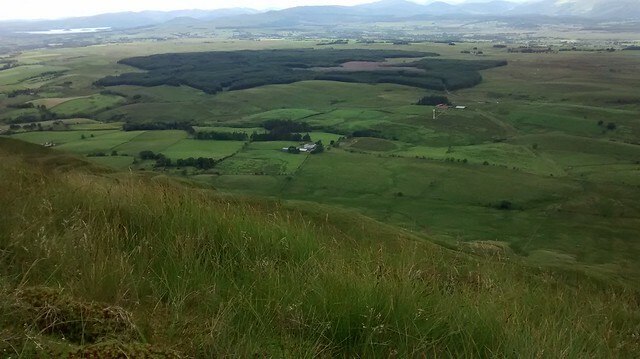 After yesterday’s disappointments nothing prepared me for the views from the top of Dungoil. A swift also flew over as I stood enjoying the views singing “I can see clearly now the rain has gone.” Please note that it was me, not the swift singing. 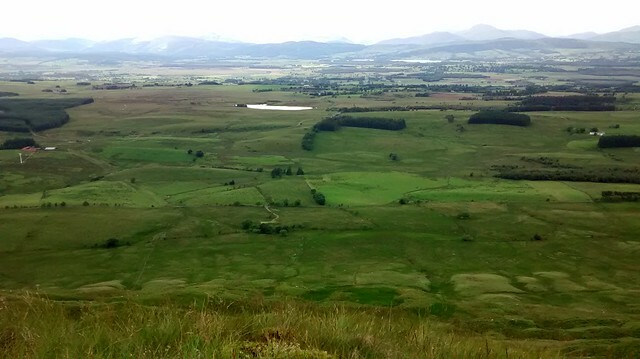 The Watershed had come alive again; behind over Holehead, ahead over Gartcarron Hill, Cairnoch Hill, onto the Gargunnock and Fintry Hills, with Stronend just across from me. Meikle Bin rose in a shapely cone over Carron Dam. This had been with me for the past couple of days although I had no views of it yesterday. 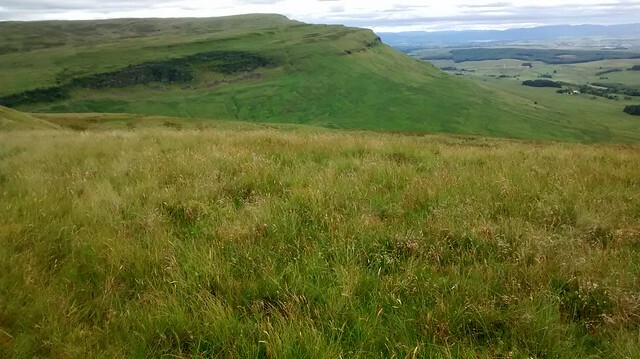 In fact this section of the Watershed snakes around the Campsies and The Gargunnock and Fintry Hills without making much Northerly progress. Before I descended I checked (with little hope) to see if the route down was ok. From my standpoint there wasn’t anywhere unaffected by windblow. I decided that I would have to sacrifice this section of the Watershed and make do with just looking down on it. What was clear was that all the tracks were free of windblow and I probably would have been fine heading down the stream this morning. Ah well, I had a great shower and lunch. Pat and Stewart are seriously good friends. Whilst I walked over 8 miles today less than 1/5th of this had been on the Watershed. I was over 24 hours from my first crossing of The Crow Road, but less than 2 miles, as the crow flies along it, from that first crossing. Not that I let these things bother me, I was going to have an easy day tomorrow. A leisurely day in pouring rain. 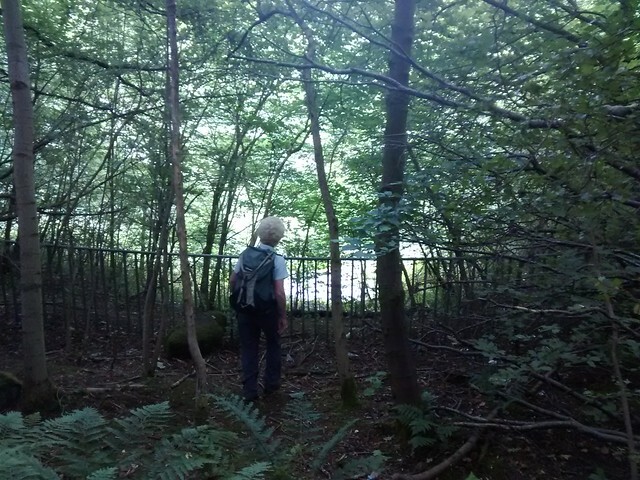 Just the day to check out the forest section from Carron Dam and back. The song? - “Norwegian Wood” nothing really to do with forests but it is what came to mind. First I walked from the B822 along the Watershed to the plantation (“Bog, glorious bog”- sorry Flanders and Swan). I couldn’t see the forest break (marked on my map) that takes you to the end of the track. The track runs along the Watershed to begin with but strays to a little to the south of east as it contours round rather than going overGartcarron Hill but I had thought I would use it as far as possible. Peter Wright talks about the break being overgrown… that was 10 years ago and overgrown was an understatement for today. 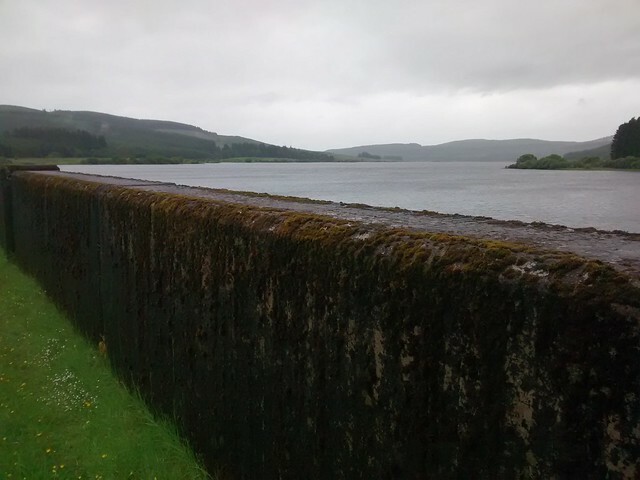 I probably gave up too early but I drove round to the dam and headed back along the track from the other end (ie the wrong way along the Watershed but easy to find the route), in a downpour and “It’s raining, it’s pouring” replaced “Norwegian Wood as song of choice. Water was certainly shedding on my watershed walk. I was elated to find a way through to where I had left off just a couple of hours earlier. It wasn’t clear from that direction as it required a left and right and left hand wiggle through to a clearer stretch of the break before it joined the track. After re-joining the track, I was in an avoidance mood and stayed on it rather than try following the true Watershed route over Gartcarron Hill. No excuses, I am just a weak and feeble woman who just couldn’t face the dripping wet forest. If there is a great Watershed arbitrator who rules that I am disqualified, I’ll find a way of leading them into the wind blow around Dungoil but in truth I am probably most the disappointed with myself. I distracted myself from my conscience by taking some watery pics of flowers. After once again hanging my dripping waterproofs around the van, a leisurely afternoon of reading I had an early night in readiness for a long circular walk tomorrow. Actual distance walked, double above. 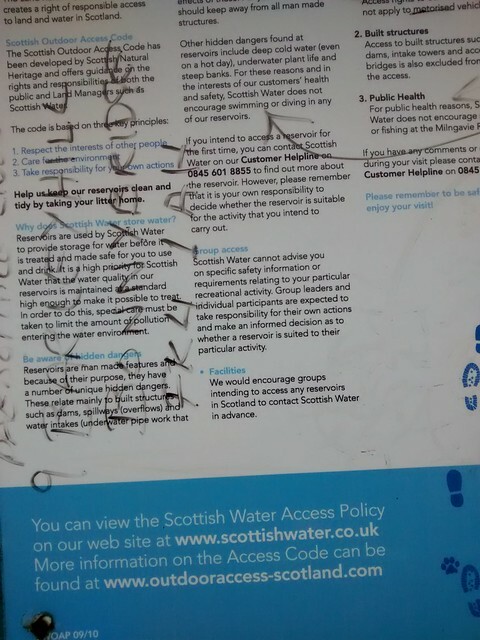 Earlier birds than me were up and swimming in the reservoir, a nearby Scottish Water Board notice advises of not adding pollutants to the water. I had already decided that I was probably a pollutant so I wouldn’t swim across the watershed line on this double-ended reservoir. The swimmers had come and gone by the time I left the van at 07.10. My plan was to walk the ‘Shed to Stronend and return via a track to the van. Total approximate mileage with lightweight bag, 18 miles, some of which, if the map was to be believed would be track assisted. I was determined, however, not to use tracks at the expense of departing from the Watershed. 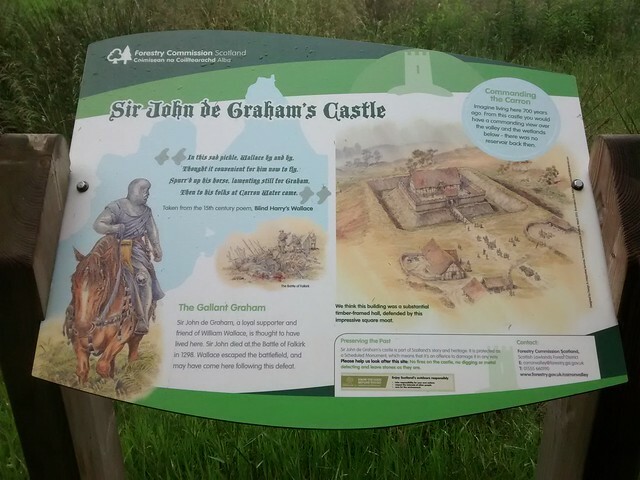 I left the reservoir just beyond Smallburn and in no time was exploring the Motte and Bailley of Sir John de Graham. (“ I’m the King of the Castle”) Then I had a puzzle or two. I had both the 1:250,000 and an older 1:50,000 map with me. The latter was more accurate when it came to forest cover. 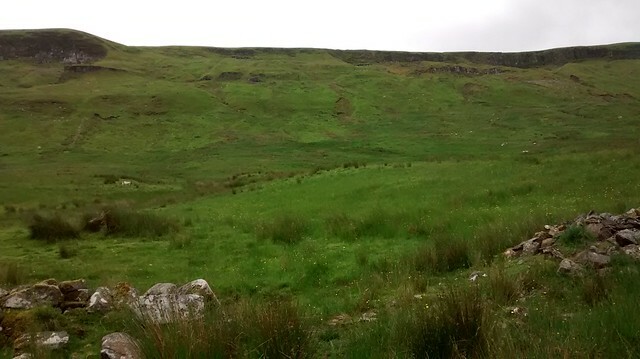 Initially both were ok as regards tracks and the 1:250,000 helped identify the right drystone dyke to follow (cue song, “Another Brick in the Wall”). 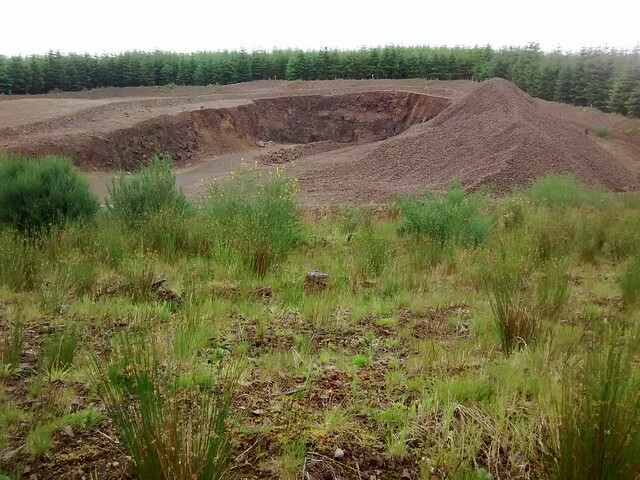 Confusingly there was a small quarry/large borrow pit at the top of the dyke, presumably to build the tracks also not marked on either map but used to support forestry extraction activities. 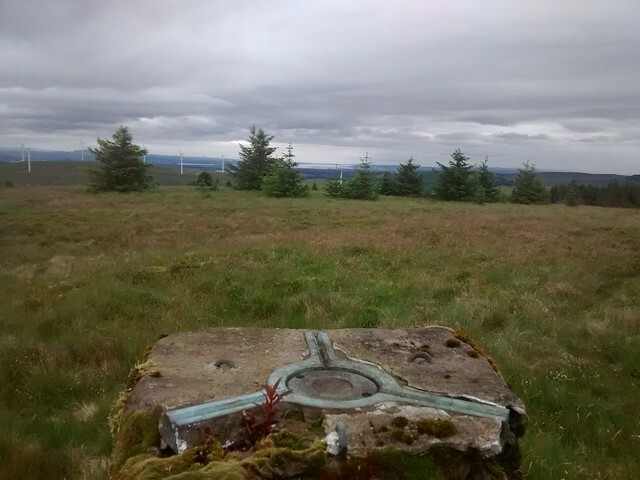 However I was now clear of the forest so the way to the summit and trig point on Cairnoch Hill (413m) was very straightforward despite reseeded sitka spruce. Descent also wasn’t too bad despite new plantings and self-seeded sitka of mixed ages that needed pushed through at times. Even the boggy ground before the road hardly posed a problem, maybe I am just getting used to bog or just happy to be clear of the forestry for the rest of the day. 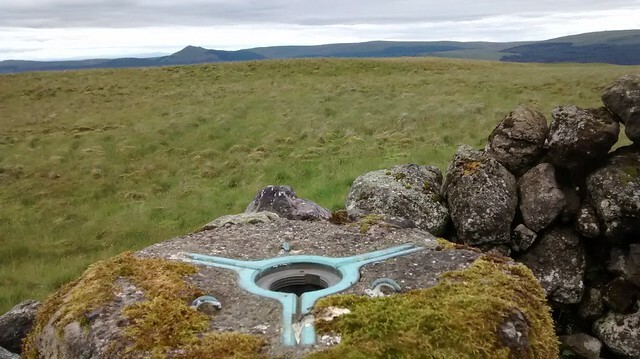 Once I reached the first turbine on the wind farm adorning Hart Hill (more have been added since the maps were printed) a track virtually followed the Watershed and I only had to depart from it on a couple of short sections to cross the highest points along the way. Just before the last bump (390m) at the end of Earlsburn Reservoir 1, a large raptor rose a couple of hundred metres in front of me from around the bump. It disappeared behind the brow and then shortly after a buzzard (my 4th sighting today) flew across my vision from SE to NW almost from the same place. It was very much smaller than the first raptor. Then not 1 but 2 of the larger raptors appeared and one was definitely a red kite. I assume the other was also a red kite but as there are ospreys in the area and Earlsburn reservoir was just below, I wondered if one was an osprey. They were only in view briefly andI didn’t see any more sight of them despite frequently looking back to the reservoir. I suspect that I was seeing 2 kites but as I also saw a pair of kestrels before the end of the day this made it my best day so far for raptors. 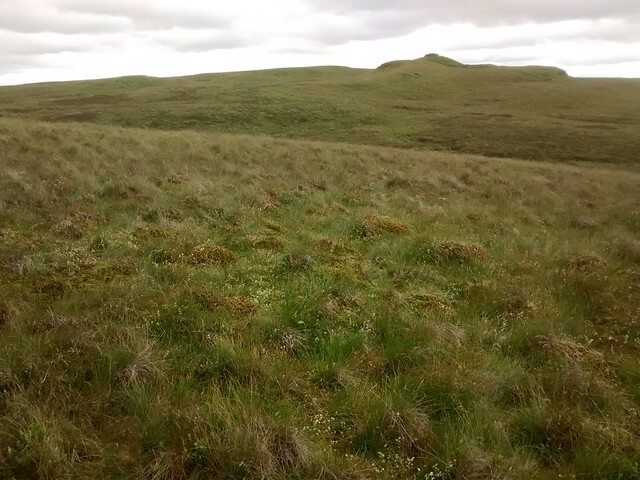 After leaving the last turbine, I had to cross a section of grouse managed moorland. Whilst it is clear that muirburn goes on, the heather was just the long side of short to make progress a little more difficult. Then bang, I was on escarpment edge with all the views you could want. 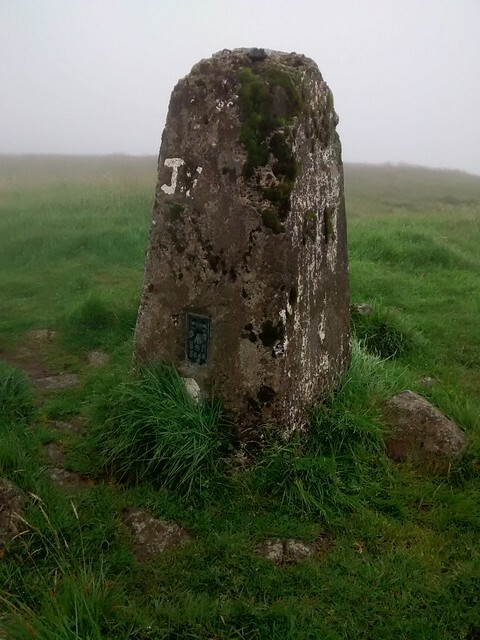 I turned west and hurried on to the summit of Carleatheran (485m) This and Stronend are both classified as Marilyn’s, maybe I will reach 10% of Marilyns climbed by the end of the Watershed. Time for lunch and spotting everything. I used to live in Doune so it was part revision, part trying to remember. It would take me a few pages to list everything I could see. Of particular significance was the Forth Estuary. The sun wasn’t quite shining but it was warm enough to have a leisurely lunch. 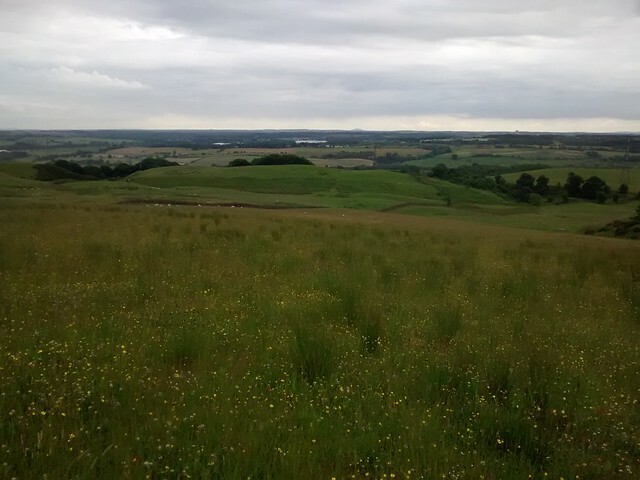 Eventually, recognising that Stronend was still looking a long way off, with plenty of up and down in between, I packed up and set off over every bump and lump along the Watershed to Lees Hill. The song was now “Climb Every Mountain” Only one of these bumps had a cairn, but only Lees Hill (411m) appears to have a name. 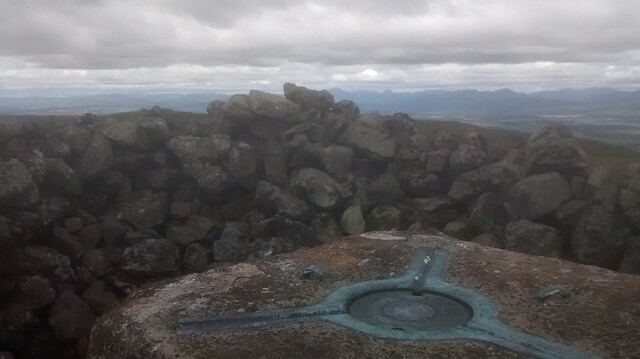 I followed the track down to the track that I would eventually follow back to Todholes and Carron Damm but first I had another summit to climb. 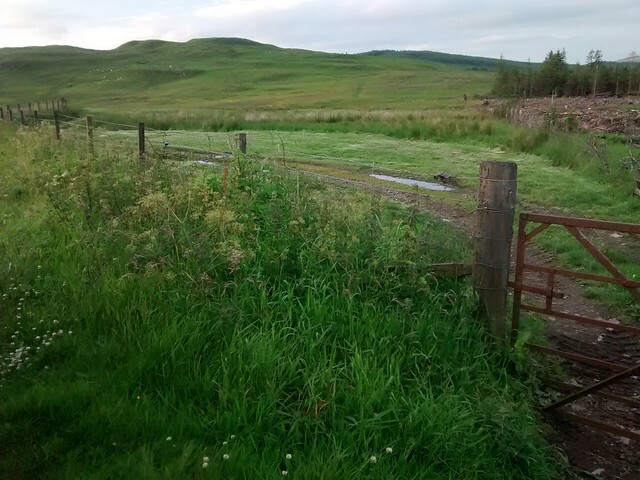 Then a fence line handily follows the Watershed up between the Boqhan Burn (off to the Forth) and the Shelloch Burn (off, via the Backside Burn) to Endrick Water and the Clyde. A manmade water way has been dug to join both these burns and therefore crosses the Watershed, I think the 3rd or 4th such structure encountered so far on the Watershed but the highest one. Just over half way up the fence I peeled off across the moorland to Stronend. I thought it was fairly close, just over a mile or a couple of km but it just never got any closer. There were the usual bumps and lumps to cross and at the summit of each one the cairn still remained stubbornly distant. 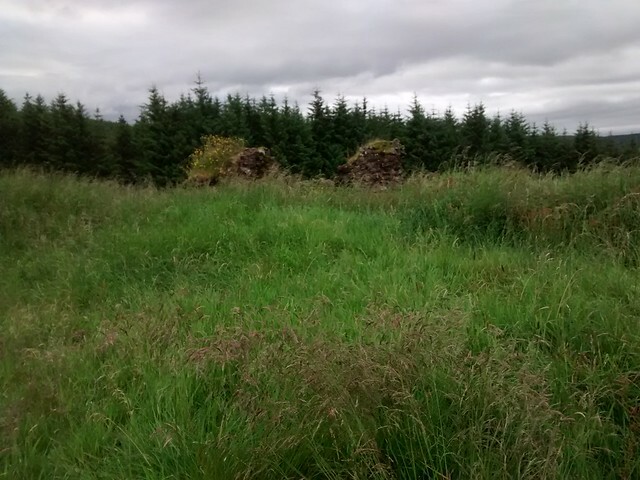 Just as I reached the last one this large cairn worryingly disappeared althogether. 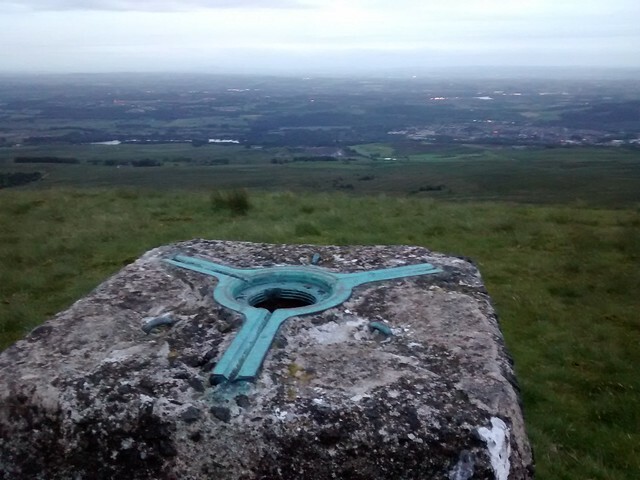 Gremlins were clearly at work but finally I snuck up and jumped on the summit (511m) and it didn’t shift again, phew! A pair of kestrels weren’t so happy with my arrival and told me so. I was pleasantly pleased with my progress. Maybe not as fast as the Watershed giants but better than some of my previous days. Of course I had my light pack and the ground hadn’t been particularly difficult but I had such a relaxing, enjoyable day without any of the frustration of the woods. 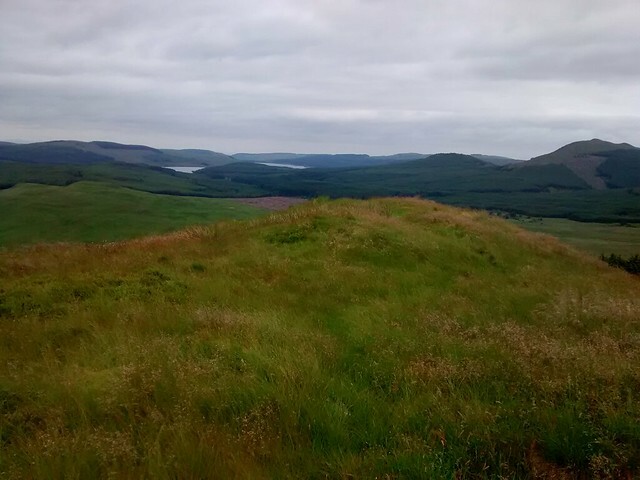 I felt back in touch with the Watershed, I could see the hills the other side of the Highland Boundary Fault and felt excited that I would soon be amongst them. I think Carleatheran has the edge on Stronend as a viewpoint but possibly because I came to the latter at the end of an enjoyable walk along the escarpment with views all the way. 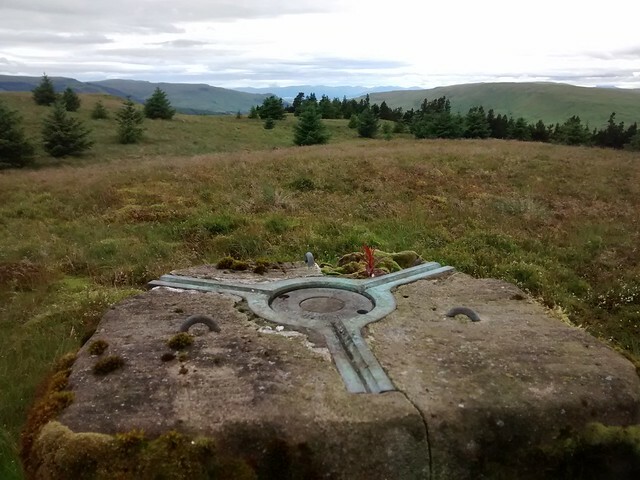 It is with shame that I have to admit that despite previously living in Doune for over 10 years, I never explored these hills, heading for the Ochils and the higher hills to the North and West. I didn’t hang around, taking heed of the kestrels’ distress and moved on after the usual photos. Now was time for another decision. 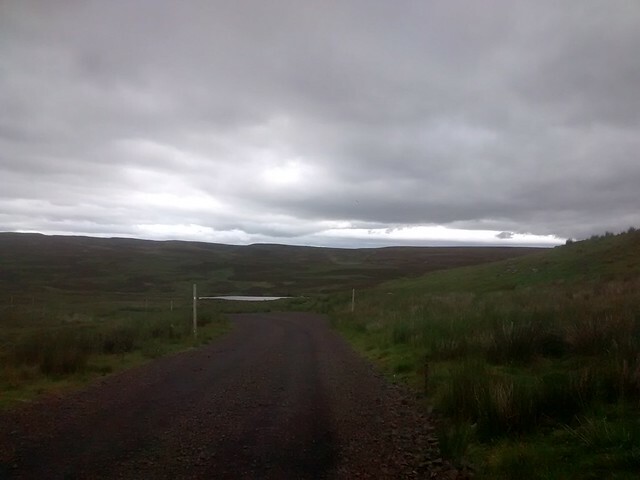 I could continue down to the Mains of Glinn and across to the B822 for the third and final crossing of this road on the Watershed. I would then have to hitch back to the van. I was nervous about the thought of not getting a lift and facing a long road walk back. One of my lifts the other day had mentioned that a road to Fintry road had been closed for roadworks earlier and I cursed myself for not checking where exactly. Peter Wright had also warned me to descend from Stronend with care. Originally I had intended to camp high up and descend with fresh legs in the morning but that was before I changed my plans after the wind blow debacle. 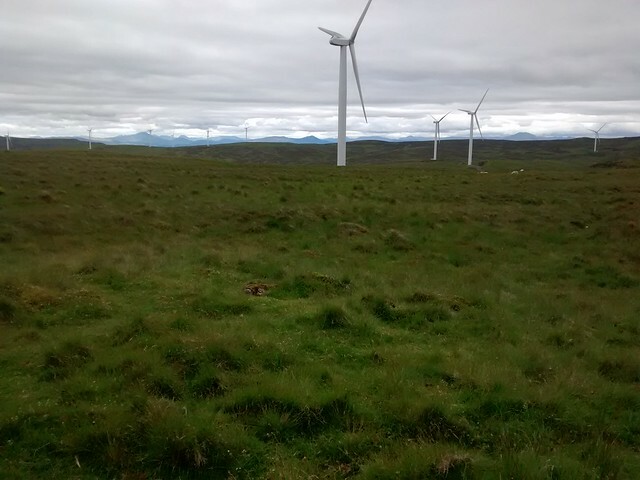 I decided to play safe and walk back to my van via the track to Burnfoot then down the windfarm track to Todholes. I chose the latter although still dithered at the top of the descent at NS637901 as it looked tempting. 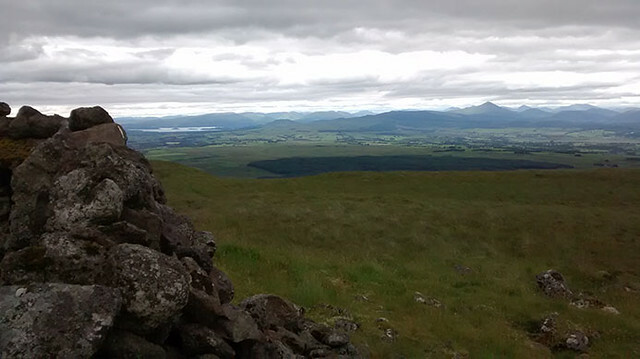 I had clear views of the Watershed continuing to Gualann Hill and beyondto Ben Lomond. Back at the van, I drove round to the "Watershed" layby on the B822 but moved to another close by as I found the view of the escarpment rather intimidating. I slept badly. The cliffs grew in size and steepness as I slept. Time and time again I attempted to climb them and each time, failed. The rather ripe atmosphere in the van may have also affected my sleep. 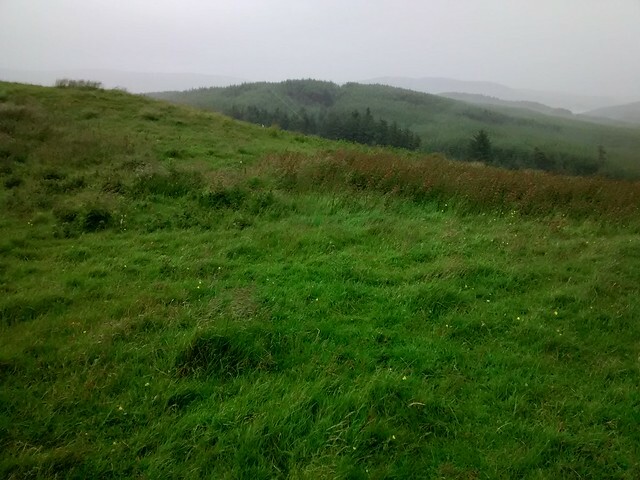 Damp clothes, unwashed socks, bog soaked gaiters and me contributing to a toxic air. Consequently, I kept putting the alarm to snooze but the forecast was for a fine morning, deteriorating to rain in the afternoon and anything would be preferable to the van. Finally, I dragged myself and my bag up and out. I took a direct line to the crags but I may have been better following the Watershed to the minor road as the short cut was a lot boggier. 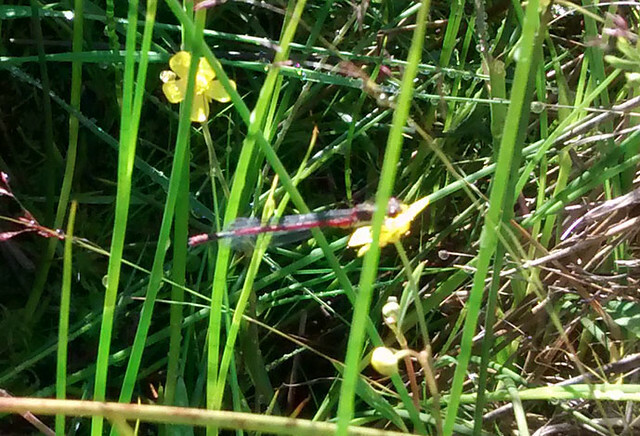 A bonus was had when I saw my first large red damselfly this season and what is more it stayed still long enough for a photo. 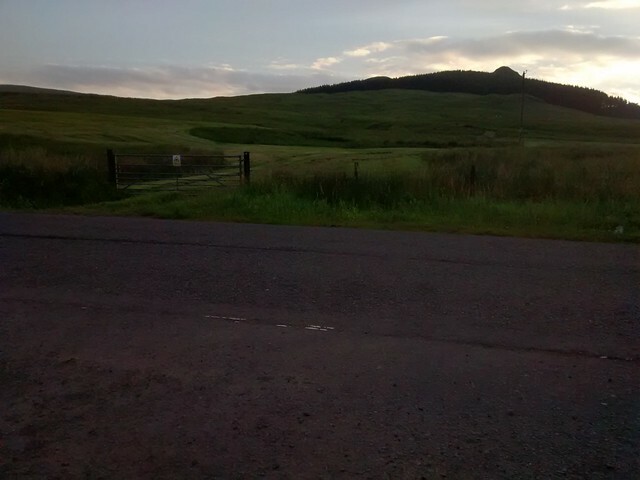 As I crossed the minor road I met a mother and daughter from Fintry, out walking their dog. 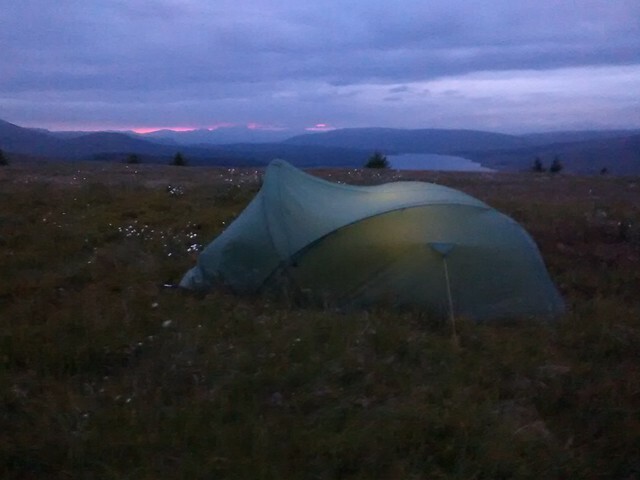 We passed a pleasant few minutes talking of the Watershed, Munros, getting through bogs and over barbed wire fences. I pointed out my route and we all agreed that it looked fine. Off I went up the steepening slope, following the line of the drystone dyke, deviating slightly to the left when a crag substituted for wall. I ignored the easiest route up (and the actual route down) and chose a more, direct steeper nose with convenient flat “steps”. 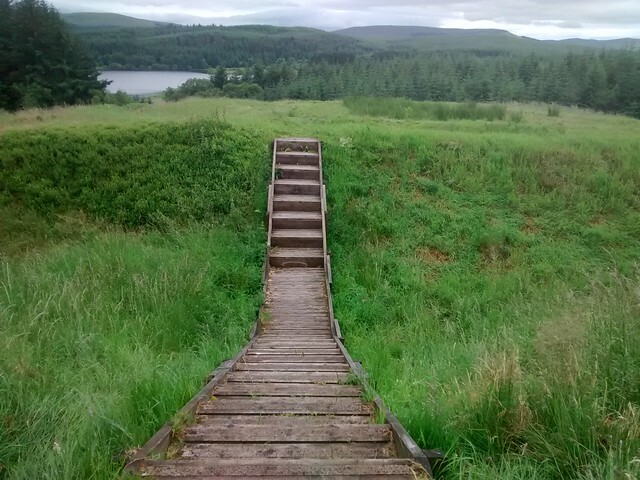 I was definitely on a “Stairway to Heaven”. 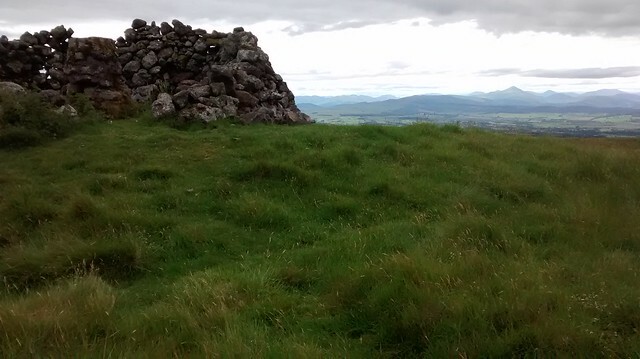 Then I was out and joined up where I had descended from the summit yesterday. Now I truly regretted not continuing down the Watershed yesterday. I did not let this mar my enjoyment of what turned out to be a lovely walk and a fine, if somewhat short end to my most recent sojourn to the ‘Shed. I set off back down the desired route which I did not find problematic. I am used to my cliffs at home which although lower in height, good practise ground for such terrain. Once down again and across the minor road there were a couple of fields of cows but both just the other side of a fence so easily avoided Then, after Powside, an ATV track followed the slightly raised and very much drier ground of the Watershed to my van just as spots of rain started. I could have continued to Balfron (and back) but felt that I needed to end on a high point with no wet clothes to further perfume the interior of the van. 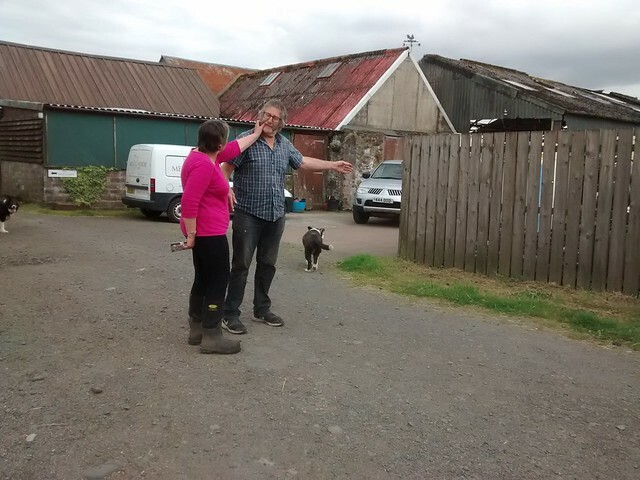 It was the first day of the stalking season, cleggs are appearing to join in the attack of the midges. I’m not sure when I will be back at this layby on The Crow Road but I will be back as after Balfron, the Watershed really starts to get interesting. Total mileage today was double above. Last edited by rohan on Wed Oct 31, 2018 11:46 pm, edited 3 times in total. Thank-you! Not many straight bits, more like a drunken ramble. 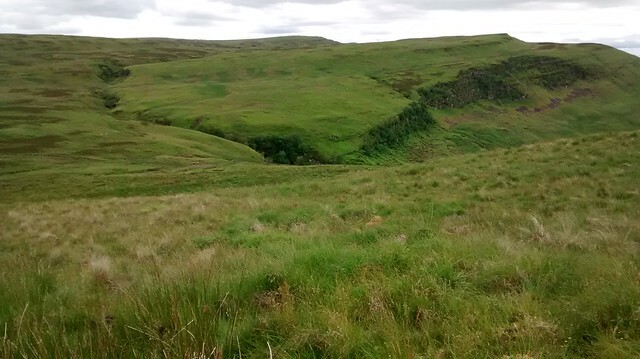 I am looking forward to passing the Highland Boundary Fault, hopefully on my next outing. Heck, that sounds like it was a pretty sore trial. I absolutely hate forestry, having experienced all the awful time-consuming consequences of trying to force routes through it!